So, it works in orange, too! This is a Clearwire site near the Portland, Oregon airport (PDX). Sites near airports are sometimes required to be painted with aviation orange and while to make them more visible to pilots. 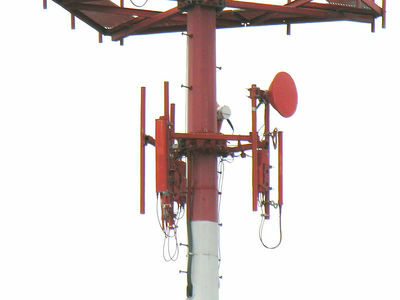 Clearly seen in this photo are Clearwire's on panel-per-sector deployment for serving the customers in the area, and two backhaul microwave antennas to link this site to other site, and on to the Clearwire POP ("point of presence") connecting to the Internet.